The phenomenon of Chinese square-dancing, which is known for generating widespread public complaints about loud music, will be regulated and choreographed by China's sports and culture authorities. 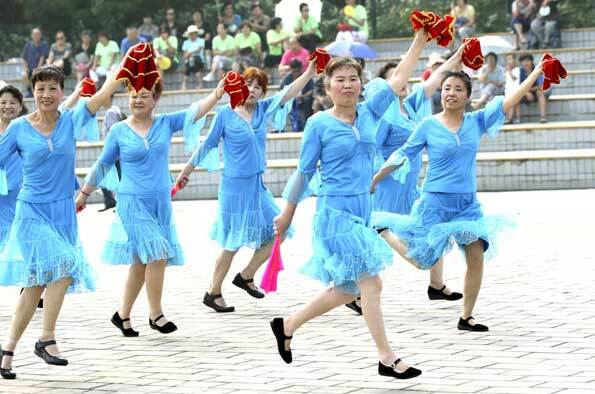 Developed as a positive form of exercise, Chinese square-dancing－generally groups of older women who dance in open spaces to loud music－has sparked heated debates online. Complaints over the noisy music and even pictures of Chinese grannies occupying sites such as New York's Sunset Park and the square in front of the Louvre in Paris, have made headlines overseas. On Monday, to regulate and promote square-dancing, the General Administration of Sport of China and the Ministry of Culture introduced 12 choreographed practices. "Square-dancing represents the collective aspect of Chinese culture, but now it seems that the overenthusiasm of participants has dealt it a harmful blow with disputes over noise and venues. So we have to guide it with national standards and regulations," Liu Guoyong, chief of the General Administration of Sport of China's mass fitness department, said on Monday. Choreographed by an expert panel including dancers and fitness trainers, the 12 square-dancing drills accompanied by pop music such as Internet hit Little Apple will be introduced to local fitness sites in 31 provinces and municipalities in the next five months. The authority will continue collecting dance ideas from the public this summer to create more official drills. More than 600 instructors for the 12 drills have been trained by the expert panel led by fitness trainer Wang Guangcheng, whose square-dancing team rocked the stage of China Central Television's Spring Festival Gala in February. "All the negative comments on square-dancing are about reckless practicing without caring about the public benefits. The unified drills will help keep the dancing on the right track where they can be performed in a socially responsible way," said the 29-year-old. However, the sports and culture authorities have not yet worked out detailed standards including the recommended volume of music, permissible times for practice and prohibited sites for dancing, said Zhou Guanglian, deputy director of the public cultural affair department of the Ministry of Culture.